The M249 fires the improved NATO Standard SS 109 type 5.56mm ammunition. The M249 replaces the two automatic M16A1 rifles in the rifle squad on a one-for-one basis in all infantry type units and in other units requiring high firepower. 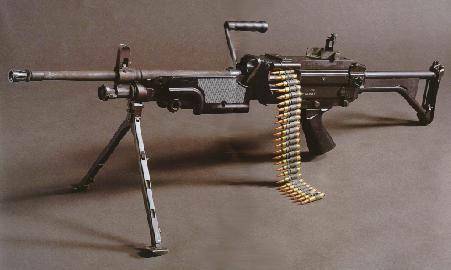 The Belgian Fabrique Nationale XM249 "Minimi" was standardized as the M249 Squad Automatic Weapon System in 1982. The M249 filled the void created by the retirement of the M1918A2 Browning Automatic Rifle (BAR) during the 1950s because interim automatic weapons (M14 series/M16A1 rifles) had failed as viable "base of fire" weapons. Caliber: 5.56 mm Ammo: 5.56x45 (SS109/M193) Vo: 940 m/s Weight: 6500 g Length: 1050 mm Barrel length: 465 mm Rate of fire: 1000 rpm Capacity: 30 round magazine (M-16 type), 100 rounds magazine (Beta-C dual Drum), belt 100 or 200 rounds.